For many, parsley is used quite simply as a garnish. While herbs like rosemary and cilantro pack a crazy punch and distinct scent and flavor, many struggle to describe unassuming parsley. I remember our mom always having a big bunch of parsley in the fridge. She would add it to recipes, but would also eat it by the handful. While not the most common take, she enjoyed its freshness. I also enjoy adding fresh parsley to recipes to brighten and balance the ingredients. I stir it into tomato sauces, sprinkle it atop a simple piece of fish, or add it to breadcrumbs. Everything tastes better with the fresh green sprinkle. When Marni gave me a couple boxes of Nella Pasta’s Parsley and Garlic Campanelle, I was struck by the shape of these little pasta bells featuring my favorite color and my favorite herby flavor. Since roasting amplifies any ingredient, I decided to roast some wintery cauliflower florets and red onions to toss with the pasta. The flower-like edges and hollow centers perfectly captured a simple caper and lemon butter sauce. For a bit of texture and dimension, I sprinkled a coating of sauteed, seasoned breadcrumbs. Preheat Preheat oven to 400 degrees Fahrenheit. On a rimmed baking sheet, toss 2 T EVOO, cauliflower, red onion, salt and pepper. Roast for about 20 minutes, tossing once with a spatula until the cauliflower is lightly browned and tender. Remove from oven and set aside. Melt 1 T EVOO in a large skillet over medium heat. Add breadcrumbs, and cook 3 minutes or until slightly browned. Pour into a plate and set aside. Add the pasta to the large pot of boiling salted water and cook for 2 minutes. When al dente, drain the pasta and return to the pot. Reserve 1/2 cup of pasta water. Add 1 T EVOO and 1 T butter to the large skillet over medium heat. Add the minced garlic, red pepper flakes, salt, pepper and saute for 1 minute. Add the lemon juice, capers, roasted cauliflower, red onions, pasta, and reserved pasta water and gently toss with tongs for 1 more minute. Add 1 T EVOO, 1 T unsalted butter, reserved breadcrumbs, fresh chopped parsley and toss for 1 more minute. Serve with grated Parmigiano Reggiano. Serves 4 - 5. 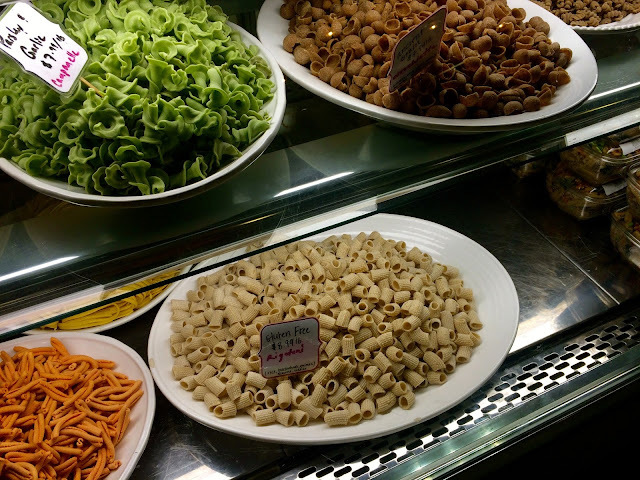 Can’t wait to visit Nella Pasta and the Boston Public Market on my next trip!